SSS series solid state I/O module provide a connection between power lines and computer interface systems. 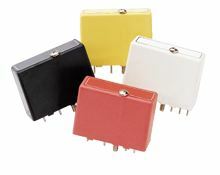 Input modules sense the presence of either an ac or dc voltage, and will send a TTL signal back to the computer. They provide feedback to the computer, giving the system information it can act upon. Output modules receive TTL signals from the computer interface, and will switch ac or dc power lines on or off. These modules can be used for control systems, turning motors, actuators, etc. on or off. 16 position backplanes similar to SSS-PC8-B. Only 50 pin card edge connectors. A 4 channel backplane with screw terminal connections. Logic power and ground are common on the signal side. Same as above except that all channels are isolated from each other. Without the common signal ground, only output modules may be used. 24 position backplanes. Uses 50 pin card edge connector.